Over the last two weeks I’ve documented the various open source information that has revealed key pieces of information about the Buk Missile Launcher linked to the downing of flight MH17. Now, using that information, I believe it’s possible to construct a timeline of events on the ground in Ukraine on July 17th that can be evidenced using a variety of open source information. This photograph came from Paris Match, which they originally incorrectly reported as being taken in the town of Snizhne, an error they later corrected. 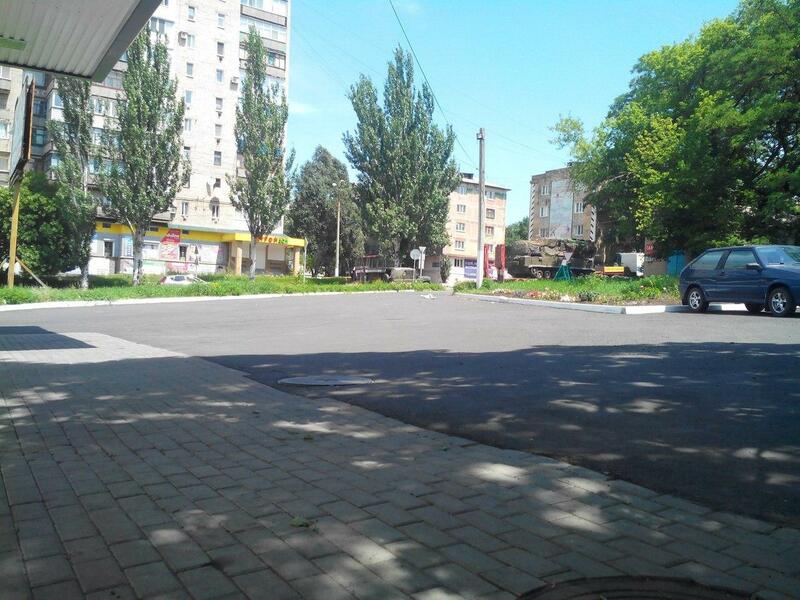 The photograph was in fact taken in the town of Donetsk, and based off the shadows visible in the photograph, it was taken some time in the morning, roughly 9am. We also learnt from this image that the truck belonged to a rental company in the city of Donetsk, with the owner of the truck, contacted by Paris Match, claiming the truck had been stolen by pro-Russian rebels. The original video, embedded above, is no longer available. A copy of it is embedded below it. This video was exactly located to the town of Zuhres, approximately 35km east of the last sighting on Donetsk with the footage reportedly filmed at 11:40am. This shows the Buk still on the trailer, heading east. This photograph from Torez, approximately 25km east of Zuhres, was taken about 12:30pm, and shows the Buk on the same truck, heading east. Note in this picture it appears to be cover in netting. 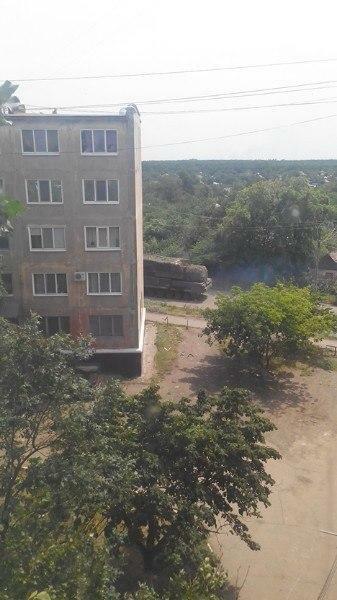 This photograph is the first to show the Buk dismounted from the trailer seen in previous photographs, and was taken around 1:30pm in the town of Snizhne. Again, in this image, the Buk is heading east. This appears to have been filmed shortly after the above photograph was taken, showing the Buk heading south out of Snizhne, around 1km away from the location of the previous photograph. Assuming the Buk didn’t stop for a break, it would have taken a few minutes for the Buk to have reached the position in the video from the point it was sighted in the earlier photograph. 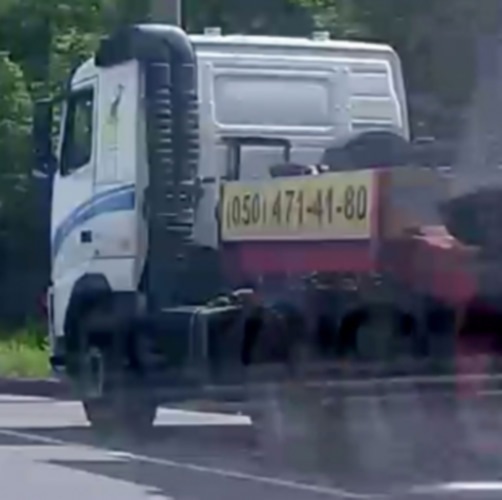 Filmed in rebel held Luhansk, around 70km north of Snizhne, and 25km west of the Russian border, this shows the Buk Missile Launcher back on the same trailer as seen in previous videos, with one missile clearly missing, and the netting seen in the Torez video removed. 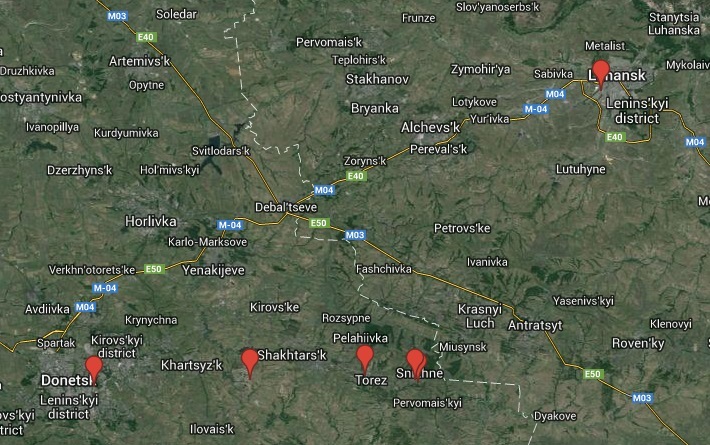 It’s worth noting that the roads the Buk was sighted on would have been the most direct route from Donetsk to Snizhne. Now we have the route of the Buk Missile Launcher, we can also look at other information related where it was on the day. 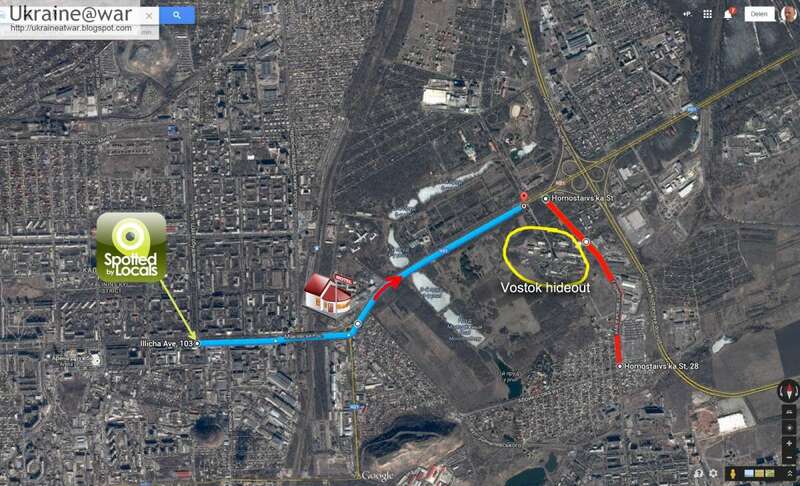 The position the Donetsk photograph published in Paris Match was taken is just before the red arrow in the centre of the map. It seems based on the time and location of that photograph, and the work done by Ukraine@War, the calls appear to be authentic. Just before lunchtime last Thursday, prior to the Malaysia Airlines plane’s takeoff, a Buk was driven through Gagarin Street, one of the central thoroughfares of Torez, witnesses said. Torez would later be the town where bodies of the victims were loaded on to refrigerated train cars. The tarmac on Gagarin Street is strewn with ruts made by tank treads, and locals say armoured vehicles controlled by separatists driving through the town have become a regular occurrence in recent weeks. The convoy last Thursday was different, however. In another shop further down the street, there was talk of a convoy of two jeeps and a missile launcher covered in a net driving past in the direction of the town of Snizhne. “I’ve never seen anything like it,” said a middle-aged woman. She said her husband showed her a photograph of a Buk launcher afterwards and she realised that was indeed what she had seen. A group of men also said they had seen a Buk. It was lunchtime when a tracked launcher with four SA-11 surface-to-air missiles rolled into town and parked on Karapetyan Street. The Ukraine@War blog also highlighted satellite map imagery shared by Storyful which showed track marks in the fields south of the location the Buk was seen driving south out of the town. Ukraine@War also claims to have located the possible point of origin of a smoke trail reportedly photographed on July 17th as originating from the same area. The Daily Telegraph followed up this information, and found scorch marks in the same fields, although it should be noted this was not definite proof of launch sites. Based on the above information alone it seems impossible to deny that the rebels were transporting a Buk Missile Launcher through the region on the same day as the downing of flight MH17. It also demonstrates the Buk was transported from Donestsk, through Torez, while still on the transporter. As yet there’s no images showing the Buk on the transporter in Snizhne, but based on the apparent destination of the Buk spotted in Torez is seems reasonable to believe it was the same missile launcher. Finally, we know a Buk missile launcher, minus at least one missile, and the netting seen in other locations pre-launch, was spotted in the rebel held town of Luhansk, and it seems reasonable to assume this was after the downing of MH17. Of course, there’s additional claims that have been made by various groups, something documented by The Interpreter in their timeline of events, but based videos and photographs there’s an extremely strong case for the Buk travelling through the region on the day of the attack, and I believe these should be considered facts that can act as a foundation for our understanding of the other claims and evidences pertaining to the down of the flight MH17. First of all, Paris Match reported “Donetsk 9am” as taken by them. It appears to be a frame from a dashboard video (see original photo as published by Paris Match). Thus, entire video needs to be requested. (http://3051562.biz-gid.ru/) . Thus, the issue of photo #1 needs to clarified. Third, Torez – 12:30pm photo and earlier published by SBU photo of alleged launch appears to have clear sky, while 1:30 pm video/photo/ videos of MH17 falling and overall reports in the areas suggest some cloud cover. Fourth, I am not sure why anyone would remove Buk from the trailer to keep Buk going on the road. Lastly, alleged “after launch” video shows Buk without factory cover, while all before launch -with it. Why anyone would parade Buk without cover several hours after launch if they have cover? Also, missiles are visible at Torez 12:30 photo (distinct, different shade of green) , but not visible on others. To my biased eye, it might be that one missile is missing on Torez 12:30 (as on Luhansk later video). With Guardian story, why Buk on a trailer will produce incredible amount of noise? Thus, to me evidence looks like there were indeed Buk in Snizhne when Snizhne was under rebel control; photos published by SBU are from different day. This Buk may well be the Buk that launched missile that hit MH17. Or it might be the Buk that launched missile that hit AN-26 3 days before. The connection of other videos/photos to Snizhne Buk is a bit superficial. Location of 17th July rocketlauncher, including tracks and burned spots now identified, according to multiple local witnesses, at Snizhne in fields just south of the railwaytrack between stantsiya Mochalynskyi (station) and stantsiya Sofino-Bridska (station), roughly 1000 meters west of the KhimMash (KHIMMASH) Plant, close to treeline parallel to the railwaytrack.